Exaggerated fear of foreign subversion can be more damaging to our democracy than external enemies. These are fever times, and none of us are immune to contagion. Week after week, daylight madness gets tweeted out of 1600 Pennsylvania Avenue: unsupported allegations of voter fraud, imaginary terrorism in Sweden, evidence-free allegations that the new president was wiretapped by his predecessor or our British allies. In the broader public, random derangement escalates: Mosques and Jewish cemeteries are vandalized, South Asian immigrants get shot. An epileptic reporter gets tweeted a seizure-inducing strobe. And, of course, the shadow of the e-mail hack on the Democratic National Committee still hovers over last fall’s election, along with the lingering stink of the FBI’s October surprise. FBI director James Comey’s appearance before the House Intelligence Committee on March 20 did nothing to calm anyone’s jangled nerves. Comey did draw one significant distinction: He made it clear that Trump’s wiretapping allegations against Barack Obama were too ludicrous to support investigation. “I have no information that supports those tweets, and we have looked carefully inside the FBI,” Comey said, in a historic rebuke of a sitting president. At the same time, he told the committee that the possibility of “any coordination” between Trump campaign officials and Russian hacking or other dirty tricks is real enough to support an ongoing FBI inquiry, which the director publicly acknowledged for the first time. But Comey’s testimony raised far more questions than it answered. 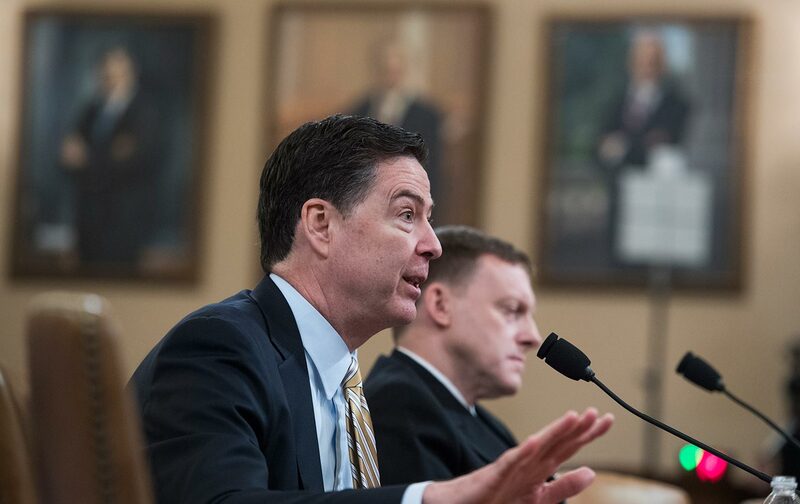 He told the committee that the FBI’s Trump inquiry began in July 2016. Why, then, did he publicly announce on the eve of the election a renewed review of the questions surrounding Hillary Clinton’s e-mail server but not this parallel investigation? And what are the outer parameters of that phrase “any coordination”? In the Trump-Russia investigation, is the FBI leading us toward a meaningful accounting of actual corruption—or, as with Clinton’s e-mails, down another politically charged rabbit hole that goes nowhere? The answer matters. The delusional world of Trump and his inner circle is evident to all except his most ardent followers. But increasingly, the president’s opponents have been gripped by wide-ranging fevers of our own, racing far ahead of the evidence on issues ranging from the alleged Russian sexual kompromat aimed at the unshameable Trump to purported deep-state machinations aimed at US news consumers. It’s understandable; we’re all in disorienting waters. But it is easier for Democrats to obsess over the e-mail hack than to focus on their own calamitous failure in the election; easier for John McCain and Lindsey Graham to pound the drum against Vladimir Putin than to contend with the GOP’s surrender to Trump and Steve Bannon. This is a dangerous and short-sighted game: From the Alien and Sedition Acts onward, exaggerated fear of foreign subversion has always damaged America more than any genuine external enemy has. And in the long run, a climate of threat—regardless of its source—is exactly what Team Trump wants: Such an atmosphere corrodes, rather than advances, any progressive American vision. But if promoting a new Cold War is no answer, neither is denying the reality of Russian hackers meddling in the election, or minimizing Putin’s web of toxic nationalism, political corruption, and mobbed-up oligarchy, which now has its US analogue—and perhaps partner—in the White House. The fact that America has its own long, appalling track record of interference in the politics of other nations doesn’t amount to grounds for impunity regarding the DNC hack. Breaking into the e-mail accounts of a US presidential campaign is a criminal conspiracy undermining the integrity of our elections, and it needs to be investigated that way. The line of accountability needs to be followed wherever it leads, including the Kremlin. Given that Comey’s credibility has already been so damaged by his ill-tempered Clinton statements this past fall; that Attorney General Jeff Sessions has already made false statements about his contacts with Russian officials; and that Congress is already deeply divided over its three current investigations, this almost certainly means that matters will sooner or later fall to a special prosecutor. It can’t be too soon: Without an authoritative account of this affair, the DNC hack will become this generation’s grassy knoll, a source of roiling speculation for decades to come. Of course, determined investigative reporting on the Trump campaign’s ties to Russian oligarchs may yet bear fruit. Leaks from a fractious and divided executive branch will continue, however much the president and deep-state conspiracy theorists protest. From the Adams administration on, leaks—as well as leakers motivated by various idiosyncratic combinations of principle and personal grievance—have been part of our system of checks and balances, and deserve robust defense. In the meantime, if cable-TV hosts and Democratic operatives were serious about challenging Putin and his allies, they might set aside one-fifth of the energy they now devote to the DNC hack and spend it reporting on the cases of Eastern European and Russian journalists and human-rights defenders who are so often jailed, assassinated, or marginalized by kleptocratic regimes. Whatever the outcome of the hacking inquiry, to view Russia’s meddling in America and Europe through a Manchurian-candidate lens is to miss the point entirely. The struggle in today’s world is about global inequity and the concentration of power upward; Putin’s oligarchs and Trump’s plutocratic cabinet are two sides of the same coin, with common interests in eroding the civil rights of opponents, delegitimizing the independent press, distracting an aggrieved public with scapegoating nationalism, and evading transparency and accountability. That—not some smoking-gun election deal between Putin and Bannon—should be our deepest concern. We need to offer an alternative—one rooted in human-rights activism and the rule of law—to military confrontation and paranoid demonization alike. To defeat Trump, we need to see clearly the complex, contradictory world in which we live, not the Cold War movie we fantasize about.